The 2019 Ford Ranger is all-new this year. Ford stopped making the mid-size truck in 2011, but the car company decided to re-release the vehicle this year. Bigger than the one Ford made almost 10 years ago, the Ranger is stylish and practical. This truck is sure to appeal to all types of buyers from couples to single adults and even people who have one or two kids. The Ranger comes with an abundance of available options as well as the latest safety features. Which Trims & Features are Available? 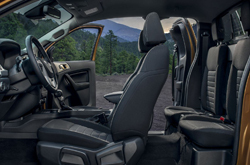 The 2019 Ranger features two cab configurations, which are the extended, or SuperCab, with a 6-foot bed or the Crew Cab that comes with a 5-foot bed. Ford is offering three trims with the Ranger. The trims are the XL, XLT and the Lariat. All come with the same 2.3-liter engine and a 10-speed automatic transmission. The Ranger XL is the base model, and if you go with this trim, you'll enjoy a few feature highlights. The vehicle's standard gear includes a manually locking tailgate, 16-inch steel wheels, power windows, comfortable cloth upholstery and automatic headlights. It also has a nice four-speaker audio system and a 3.5-inch center screen that features a rearview camera. With the XL, you'll have a USB port for your smartphone and an auxiliary jack. Next up is the XLT trim. This one has a few more features, things like 17-inch alloy wheels, front and back parking sensors and automatic high beams. With the XLT, you'll get an upgraded grille, cruise control and fog lights. It also has a 4.2-inch center screen that is equipped with Ford Sync and an additional USB port. You'll have a remote tailgate locking system with this model, keyless entry and a 4G Wi-Fi hotspot. If you choose the XLT, you'll also get to rock out to a six-speaker audio system. The top trim level that you can get is the Lariat. It comes with everything that Ford offers on the XLT plus equipment like LED headlights and taillights, 18-inch alloy wheels and leather upholstery. If you decide to upgrade to this trim, you'll also get dual-zone automatic climate control, Apple CarPlay and Android Auto. 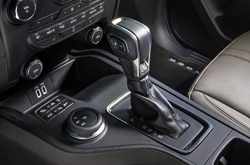 Other amenities include power-adjustable and heated front seats along with an LED cargo lamp. With Ford, most of the equipment that's available on the upper trim levels can be added to lower ones as options. The car maker is also offering an FX4 Off-Road package with the Ranger. This package features off-road tires, an electronically locking rear axle and underbody skid plates. Ford is also including upgraded shocks and suspension tuning. If you decide to buy the 2019 Ford Ranger, you can get it with a Trailer Tow package. This option features a four-pin/seven-pin wiring harness in addition to a Class IV trailer hitch. The New Ford Ranger has Plenty of Get Up and Go! For now, just one engine is available in the Ranger: a turbocharged 2.3-liter four-cylinder. It produces 270 horsepower and 310 pound-feet of torque. The car maker's recent turbocharged engines are giving drivers plenty of power along with enough zip to reach highway speeds without it feeling sluggish or delayed. With 270 horsepower, the Ranger's engine is very competitive in this category. 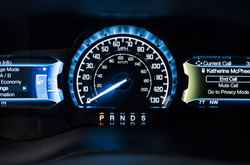 With the 2019 Ford Ranger, you'll have safety systems like forward collision warning that comes with automatic emergency braking and lane keeping assist. The Ranger has plenty of airbags to protect you in the event of an accident. You can also get the truck with pedestrian detection and lane keeping assist. This is a midsize truck with full size features. 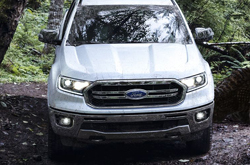 See the 2019 Ford Ranger at our Duluth dealership and take a test drive.